The 2nd Hard Disk Drive Caddy / Adapter to bring you new maximum data storage flexibility, with the compact portable design. With the second HDD in your Laptop. Add a second 2.5" HDD or SSD to your laptop via the E-Modular (E-Module) Bay / optical drive bay with this drive caddy. 1 x 9.5mm HDD SATA TO SATA CADDY. Allows you to install a 2nd SATA 2.5” notebook hdd, enabling you to increase the hard drive storage for your laptop. 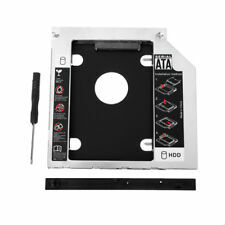 Support hard disk: 2.5 HDD, SATA, SATAII SDD. Simply remove your CD/DVD-ROM drive and put the Caddy (with the added hard drive) in its place. 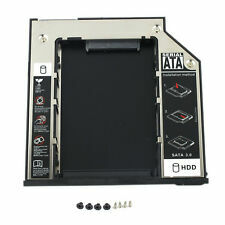 SATA 2ND Hard Disk Drive HDD caddy/adapter for any uses 9.5mm height DVD drive with SATA connector to the motherboard. 1 x 2nd HDD Caddy. It work with SATA Hard drive, and SSD (Solid State Drive) as well. Dell Latitude M2400 M4500 M4400. For Dell Latitude E6400 E6500 E6410 E6510. HDD Interface: This device takes a SATA (2.5" SATA or SSD Drives). This Serial ATA Hard Drive Adapter lets you add a second hard drive to the laptop systems. 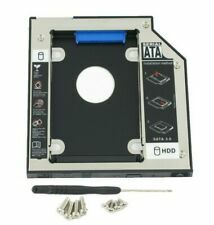 Interface:SATA(ODD)-SATA(HDD). 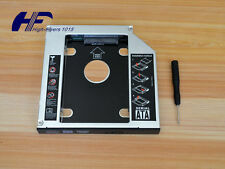 Universal for 12.7mm hard disk, 2.5" SATA to SATA. 1pc x hard drive caddy with flat bezel (with screws). Material: Magnesium alloy. Connected notebook /computer interface: SATA. HDD Interface: SATA. Caddy Thickness: 9.5mm. Laptop Driver 9.5mm Caddy x 1. Laptop/ Mother Board Interface: SATA. Due to the difference between different monitors, the picture may not reflect the actual color of the item. DELL Latitude E5440 E5540 E6440 E6540. Laptop Hard Drive Cover Caddy. Server Parts & HDD Caddy/Tray. Simply pull out your CD/DVD drive and replace it with our optical bay hard drive caddy. This caddy accepts 2.5" SATA (Serial ATA) HDD only. Dell Latitude E6440 E6540 M2800. Laptop Hard Drive Cover Caddy. Server Parts & HDD Caddy/Tray. This caddy accepts 2.5" SATA (Serial ATA) HDD or SSD. Laptop Keyboard. Simply pull out your CD/DVD drive and replace it with our optical bay hard drive caddy. The 2nd Hard Disk Drive Caddy / Adapter to bring you new maximum data storage flexibility. With the second HDD / SSD in your Laptop, you can speed to backup important applications and critical data. LENOVO T420 T430 T520 T530 X220 W510 T420i T510i T510 W530. Laptop Hard Drive Cover Caddy. Swapping the Ejector and faceplate from your original DVD Drive maybe required. Server Parts & HDD Caddy/Tray. Laptop Hard Drive Cover Caddy. Server Parts & HDD Caddy/Tray. Dell Inspiron 1440 1545 1564 1750 1764. Simply pull out your CD/DVD drive and replace it with our optical bay hard drive caddy. Laptop Keyboard. HP Pavilion G4 G6 G7 replace UJ8B1 DS-8A5LH. Laptop Hard Drive Cover Caddy. Server Parts & HDD Caddy/Tray. Simply pull out your CD/DVD drive and replace it with our optical bay hard drive caddy. Laptop Keyboard. The 2nd Hard Disk Drive Caddy / Adapter to bring you new maximum data storage flexibility. With the second HDD in your Laptop, you can speed to backup important applications and critical data. Simply remove your CD-ROM drive and put the Caddy (with the added hard drive) in its place. For Apple MacBook Pro A1278 A1286 A1297. Laptop Hard Drive Cover Caddy. Server Parts & HDD Caddy/Tray. Simply pull out your CD/DVD drive and replace it with our optical bay hard drive caddy. This caddy accepts 2.5" SATA (Serial ATA) HDD only. Dell Latitude E6520. The 2nd Hard Disk Drive Caddy/Adapter will bring you new maximum data storage flexibility. With the second HDD in your Laptop, you can speed to backup important applications and critical data. Dell E6420 E6520 E6320 E6430 E6530 E6330. Simply remove your CD/DVD-ROM drive and put the Caddy (with the added hard drive) in its place. Add this caddy to your laptop to give you another hard drive. 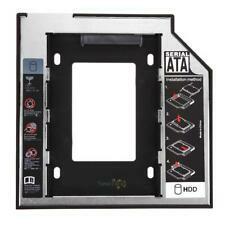 Support hard disk: 2.5 HDD, SATA, SATAII SDD. Support: SATA. Insert the drive into the Adapter at an angle. Slide the drive into the connector until it locks into place. Compatible Models: Laptop with a 9.5mm thick DVD-ROM. HP EliteBook 2530P 2540p 2560p 2740p. Laptop Hard Drive Cover Caddy. Server Parts & HDD Caddy/Tray. Simply pull out your CD/DVD drive and replace it with our optical bay hard drive caddy. Laptop Keyboard. 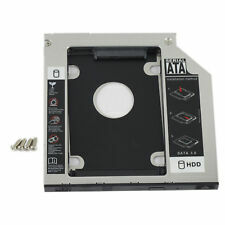 2nd SATA Second HDD Caddy To SATA 2.5"HDD SSD Enclosure Holder For Laptop CD ROM. HDD Interface: This device takes a SATA (2.5" sata1 sata2 sata3 or SSD ) drive. Simply remove your CD/DVD-ROM drive and put the Caddy (with the added hard drive) in its place. Laptop Hard Drive Cover Caddy. Lenovo Ideapad 320-14/15/17,Ideapad 520-15,Ideapad 330-14/15/17. This Serial ATA Hard Drive Adapter lets you add a second hard drive to the laptop systems. Add this caddy to your laptop to give you another hard drive. Laptop Hard Drive Cover Caddy. Server Parts & HDD Caddy/Tray. Simply pull out your CD/DVD drive and replace it with our optical bay hard drive caddy. This caddy accepts 2.5" SATA (Serial ATA) HDD only. Lenovo Thinkpad T440p T540p W540p T540 W540 W541. This caddy accepts 2.5" SATA (Serial ATA) HDD only. Simply pull out your CD/DVD drive and replace it with our optical bay hard drive caddy. 1 x 2nd HDD Drive Caddy. HP ProBook 6560b 6565b 6570b. Laptop Hard Drive Cover Caddy. Server Parts & HDD Caddy/Tray. Simply pull out your CD/DVD drive and replace it with our optical bay hard drive caddy. Laptop Keyboard. This caddy accepts 2.5" SATA (Serial ATA) HDD only. HP EliteBook 8460p 8560p 8760p. The 2nd Hard Disk Drive Caddy / Adapter to bring you new maximum data storage flexibility. With the second HDD in your Laptop, You can speed to backup important applications and critical data ( Simply remove your CD-ROM drive and put the Caddy (with the added hard drive) in its place. ). This caddy only fits unibody models (Late 2008 / Early 2009 / Mid 2009 / Late 2009 / Early 2010 / Mid 2010 / Early 2011), NOT suitable for other non-unibody models. Unibody MacBook: MB466LL/A, MB467LL/A, MB881LL/A, MC240LL/A, MC207LL/A, MC516LL/A. Add this caddy to your laptop to give you another hard drive. This 2nd SATA Hard Drive Adapter lets you add a second hard drive to the laptop systems. This device accepts 2.5" /9.5mm SATA HDD/SSD. Dell Insipiron 15 3541 3542 3543 3545 DU-8A5LH. NewDELL E6420 E6520 E6320 E6430 E6530 For Elitebook 2ND HDD SSD Hard Drive Caddy. 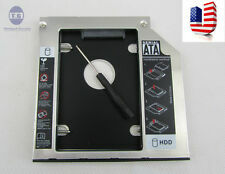 Optical Bay E6430 Hard Drive Caddy 2ND NEW E6530 HDD CD/DVD-ROM SSD 9.5 MM E6320. Dell E6420 E6520 E6320 E6430 E6530 E6330. HDD Interface: SATA. Caddy Thickness: 9.5mm. Laptop Driver 9.5mm Caddy x 1. Laptop/ Mother Board Interface: SATA. Also note that monitor settings may vary from computer to computer and may distort actual colors. Universal 2.5" SATA HDD SSD Optical bay Hard Drive Caddy Adapter for Dell Latitude E6420 E6520 E6320 E6430 E6530 E6330. for Dell Latitude E6420 E6520 E6320 E6430 E6530 E6330;. remove the original optical drive front plate / bezel and ejector latch to transfer onto the caddy for proper working before installing it. HDD Interface: This device takes a SATA (2.5" sata1 sata2 sata3 or SSD ) drive. Simply remove your CD/DVD-ROM drive and put the Caddy (with the added hard drive) in its place. Add this caddy to your laptop to give you another hard drive. IBM Lenovo ThinkPad T420 T420i T430 T430i T430u. 2nd HDD SSD Hard Drive Caddy Adapter LED For Lenovo ThinkPad T510 T520 T530. The 2nd Hard Disk Drive Caddy / Adapter to bring you new maximum data storage flexibility. A 2nd Hard Disk Drive Caddy / Adapter that brings you a maximum data storage flexibility. With the second HDD in your Laptop, you can speed to backup important applications and critical data. Simply remove the optical drive and put the Caddy (with the added hard drive) in its place.